Woman cannot live by books alone. She also needs handbags, so by the transitive property of well-read fashion, we must conclude that the two should be combined. If you can't follow the math, send the Cliff Notes to your iPad, Kindle or Nook and divide by the square root. Or just trust me. It's faster and yields the same result. I admit I may biased on this subject. Quirky handbags are fun and I love the humor of the book/handbag hybrid. Let's start at the high-end with Olympia Le Tan and the embroidered book cover clutch. These bags are made with painstaking detail, embroidered and made in small quantities, so the chances of you landing on a red carpet with the same bag as Charlize Theron are small at best. Luckily, I do not often find myself on any red carpet unless it leads into a mid-priced hotel, so there is really no chance of duplication with Charlize, unless she is having a really bad day. 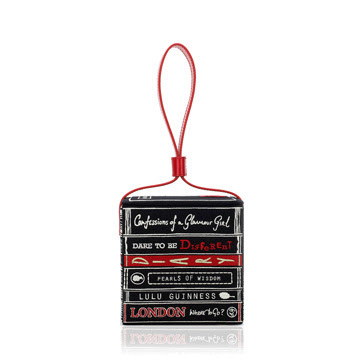 Next we have the utterly fabulous Lulu Guinness book store handbag (see shot of the whole bag at the top). It has a crime section (and travel, romance and poetry but really the crime section is the most important) and it's own, very chic, black cat. The pictures don't do it justice. This season Lulu also has the stack of books bag, but the bigger handbag is where my heart is. Kate Spade's publishing theme continues to evolve. Her series of book clutches of re-imagained classics (GREAT GATSBY, the first clutch and my favorite, can be seen below). Titles include Jane Austen's EMMA & PRIDE AND PREJUDICED and Dickens' TALE OF TWO CITIES. The covers are re-imagined by Spade's team of designers. 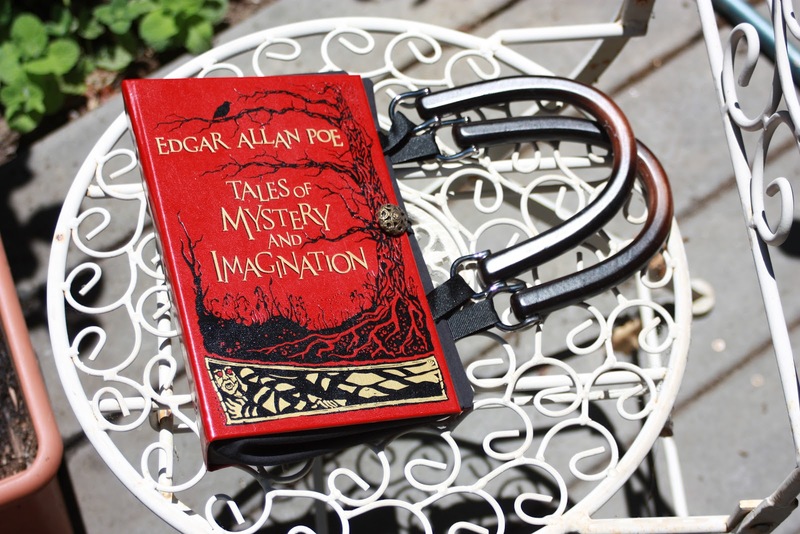 Have you found any fabulous book inspired handbags? Don't be selfish and share below. OMG that Lulu bag is amazing!! And the Poe that you made is adorable. Kim is right. That Lalu bag is seriously fabulous and stylish. I just loved the colors and fabric. Those bags are so creatively designed and fabricated. I won that Poe!!!! I love the Lulu, but I'm afraid to click on the link and see the price.